Spires of magenta trumpets will fill your garden with late spring colour. Naturalises well, increasing year after year. 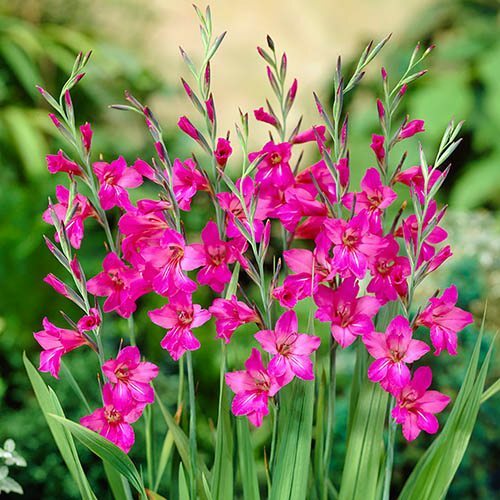 Spikes of magenta trumpets to fill your garden. Ideal as a cut flower. Supplied as 50 corms ready for planting. Easy to grow, plants can be left to naturalise where they will spread freely and produce a mass of gorgeous colour - the perfect way to get larger displays year after year. Plus they won't need staking so really easy to look after! Perfect to grow as a cut flower, byzantinus can also be dotted about between shrubs and other herbaceous perennials where they add height and a dramatic colour contrast in flower beds and even pots. Holder of the prestigious RHS Award of Garden Merit, you can be sure that this is a garden-worthy plant sure to perform - giving you years of glorious colour. We supply 50 corms of good sized corms, 7/8cm circumference, ready to plant now. Supplied as 50x 7/8cm circumference bulbs, ready for planting now. Fully hardy, leave bulbs to naturalise. Plant 10 to 16cm deep in fertile, well-drained soil in full sun with a little grit or sharp sand added to improved drainage. Corms can be left over winter in the ground and will naturalise. If planted in pots, stop watering at the end of the summer and bring the pots under cover for the winter.